LONDON, ENGLAND (February 6, 2019): Modiphius Entertainment has confirmed the release date of their upcoming Sciences Division supplement and Alpha Quadrant sourcebook, and announced a brand new missions book entitled Strange New Worlds. 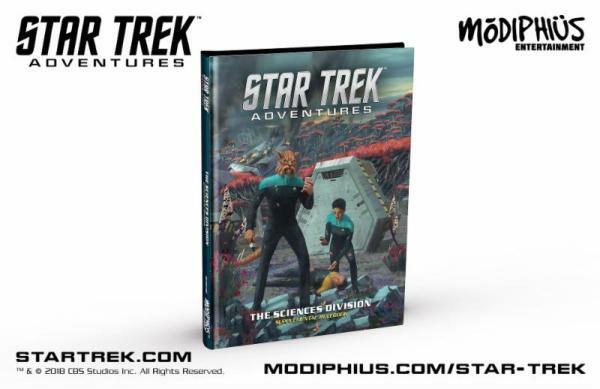 Star Trek Adventures uses the Modiphius 2d20 System, designed by Jay Little (Star Wars: Edge of the Empire, X-Wing Miniatures Game) and developed by Nathan Dowdell (Black Crusade, Only War, Mutant Chronicles 3rd Edition, Conan: Adventures in an Age Undreamed Of, Infinity The Roleplaying Game). Star Trek Adventures, under license from CBS Consumer Products, continues to expand its range of products to provide Star Trek fans with an incredible roleplaying experience in their favorite universe.